Founded in 1993, the Globe Bookstore and Café is Prague’s first and best English language bookstore with a lively and trendy café that offers delicious coffee, cocktails and some of Prague’s best home cooking with great burgers, salads, pastas and other favorites and a full American brunch menu on the weekends. 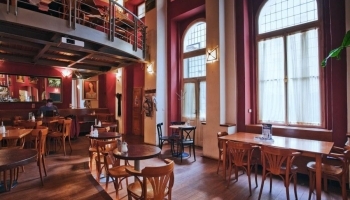 Conveniently located in a beautiful 130 year-old historic building in the heart of Prague with nine meter vaulted ceilings, the Globe Bookstore is expat Prague’s literary epicenter that provides a unique meeting place for artists, writers, students and travelers. The café also regularly hosts literary readings, quizzes, karaoke, live music and other special and top sporting events. 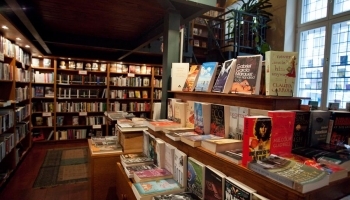 The bookstore offers a wide selection of approximately 10,000 hand-picked quality titles that will impress even the most learned reader and the Globe also displays and sells art from some of the region’s leading artists. The Globe is a place where people of all ages, backgrounds and nationalities come to meet, browse, read, surf the internet, have engaging discussions or just escape the daily grind and relax. The Globe Bookstore and Café is a must see for anyone who is passionate about books, art, food and life.